Among the most beautiful of floors, ceramic tile floors can have a very long life. However, you must have a smooth and rigid sub-floor to support the installation. Lacking flexibility, ceramics can crack when installed over a rough or uneven surface or a thin sub-floor. YS Flooring commercial customers base their selection on design specifications, application, budget and other considerations. The YS Flooring professionals use only high quality workmanship. Our floor preparation experts make certain your ceramic floor will last and perform. Every ceramic floor is installed according to specification. Complete customer satisfaction is always the goal. 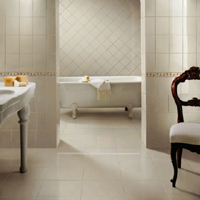 Ceramic tiles are tiles which are made from ceramic materials like earthenware and porcelain. Tiles are simply flat slabs of material which can be used in a range of applications, including flooring, countertops, roofing, walls, and showers. There are numerous styles of ceramic tiles available, from terra-cotta roofing tiles used in Mission-style architecture to delicate hand-painted porcelain tiles intended for ornamental splashbacks in kitchens. Numerous home supply stores stock ceramic tiles, along with tiles in other materials like glass and stone. Tiles come in a range of shapes and sizes. They can be square, octagonal, rectangular, or triangular, for example, and they may be very thick, as is the case with tiles designed for flooring, or quite thin, in the instance of ceramic tiles used to make trivets. Many stores are happy to order specialized tiles with specific designs or colors for people who are not satisfied with the products on display. 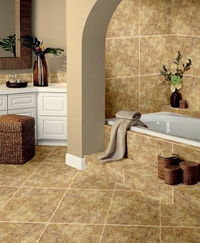 Many people like to use ceramic tiles to make flooring. There are a number of advantages to tile flooring. It tends to be extremely durable, and heating and cooling systems can be installed underneath it to radiate through the floor. Many people also find tile flooring aesthetically pleasing, and it is easy to clean, especially in situations where drains are installed in the flooring, allowing people to essentially hose it down. Tiles can also be used to line showers, pools, and bathtubs, to create countertops, to make decorative accents both inside and outside homes, and for an assortment of other purposes. Because tiles have such diverse uses, when you purchase ceramic tiles, you should check to be certain that they are appropriate for your intended use. Some tiles, for example, are not treated to withstand water, in which case they are designed to be ornamental rather than functional, and others may have design features like ribbed backs which make installation on certain services easier. Ceramic tiles are often available in unglazed form as well as in glazed form. Some unglazed tiles can be custom-painted and re-fired to set the glaze, while others are ideal for situations in which porous tiles are needed, such as when making garden walkways. If you are interested in making mosaic with ceramic tiles, many tile stores are delighted to give you broken scraps and odd remainders of tiles, especially once you establish a friendly relationship with them.